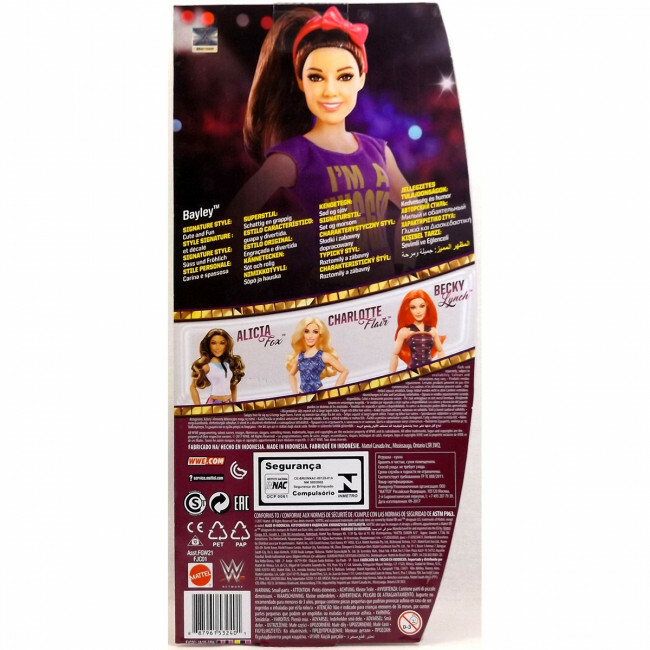 Action meets fashion with WWE Superstars Fashion Dolls! Each WWE Superstars doll wears a fashion inspired by their signature style for a look that fans will love! Plus, these incredible dolls can also stand alone with their shoes on—perfect for recreating WWE Superstars action-fashion poses! Action meets fashion with WWE Superstars Fashion Dolls! These approximately 12-inch WWE Superstars fashion dolls feature multiple points of articulation, amazing details and are fearlessly fashionable! Plus, these incredible dolls can also stand alone with their shoes on—perfect for recreating WWE Superstars action-fashion poses! Each doll includes outfit and shoes. 4 dolls to collect:- Bayley, Alicia Fox, Charlotte Flair and Becky Lynch. Each sold separately, subject to availability.